It always seems that we get the best weather on travel days. We left Riga on a beautiful day with bright blue skies, giving us a brief glimpse of the city in sunlight. The sun was still shining when we arrived in Vilnius around four hours later. We had again booked a cheap hotel here, but as is often the case, it was a little out of the city. The description told us it was only 7km from the far end of the Old Town, and 4km from the bus and train station, where the Old Town started. Public buses only took 10 minutes, and the hotel shuttle was even quicker. Imagine our surprise to discover the hotel was out on the side of the main highway leaving town with not a single building around! Right near the bus stop where we got off the bus, was the Vilnius city limits sign! Even though it felt remote, the Ibis Styles was only a few years old with comfy rooms, decent food and good facilities. For the price we paid (€34 per night including breakfast) it was a great deal. And once we got our head around the idea that we couldn’t even pop to the local shops for a snack, all was good. We got up the next morning and the sunshine had turned to grey skies. Oh well, just like so many other days in the past couple of weeks. We got on the bus early and made our way into town, giving ourselves plenty of time to explore a little, then head inside for a coffee and to defrost. When we came back out again, it was snowing. I should not have been surprised. We were about to start a walking tour, and it always seemed that was when we got the worst weather of all. 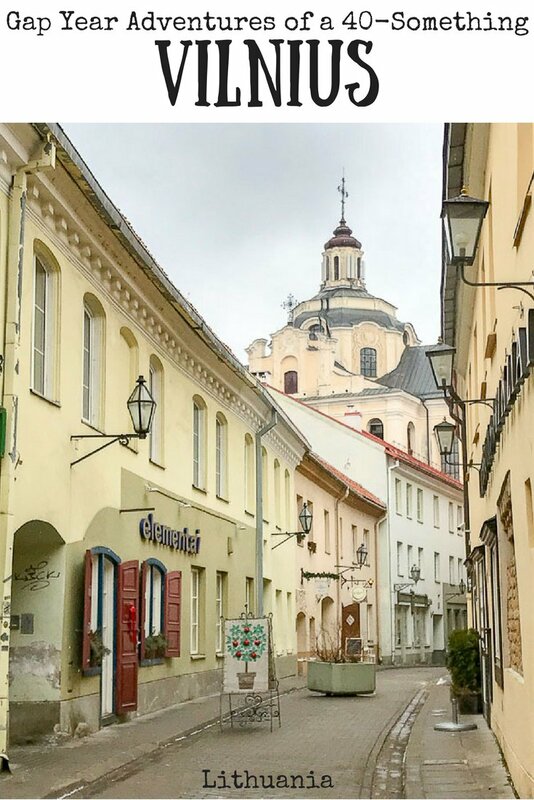 We chose to go with Vilnius Free Walking Tours, mostly because the timing was good, but also because they offered a second free tour run in the afternoons on Thursday and Saturday – and we were there on a Thursday, so why not do them both to see two different parts of the city! In the morning was the Old Town tour. Like all good walking tours, we started at the start! Right next to the monument to Grand Duke Gediminas, who was the bloke who decided that there should be a city here after he had a dream that involved a hill and some wolves! We can still see a remnant of the original fortress sitting on top of a nearby hill. In the past it has been possible to climb the hill and have great views over the Old Town, but it has been closed down for now as the sides of the hill are collapsing through erosion. Possibly it will be open again during the summer when the weather is a bit nicer. 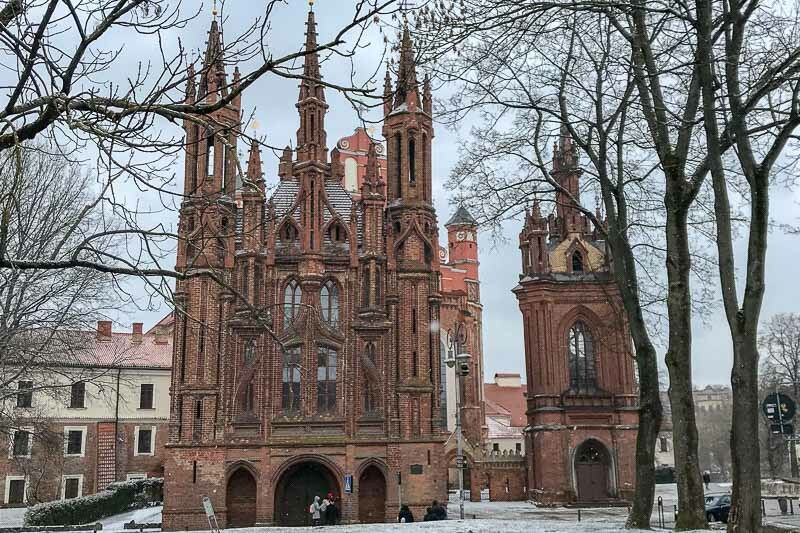 Also in this area is the imposing Vilnius Cathedral, which really looks nothing like any other cathedral thanks to various renovations over the years. Even the clock tower has three different types of architecture as it changed purposes and was added to along the way. The most prestigious church in Vilnius, the Cathedral, doesn’t look much llike a church at all. 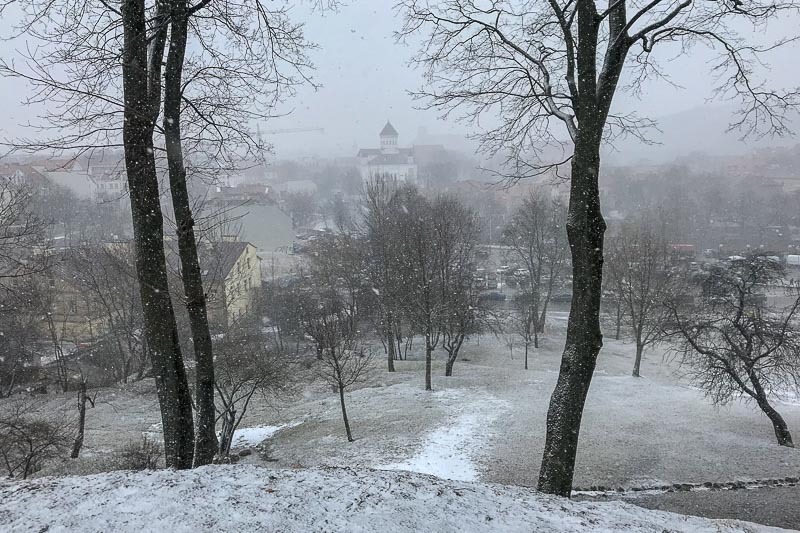 The snow continued to fall as we made our way to the Presidential Palace. This is a working government building, and the President does live and work here, although she was off at a European conference when we were there. I was surprised to see no security services anywhere in the area. It really did look as though we could walk up and knock on the door and we would be able to enter. 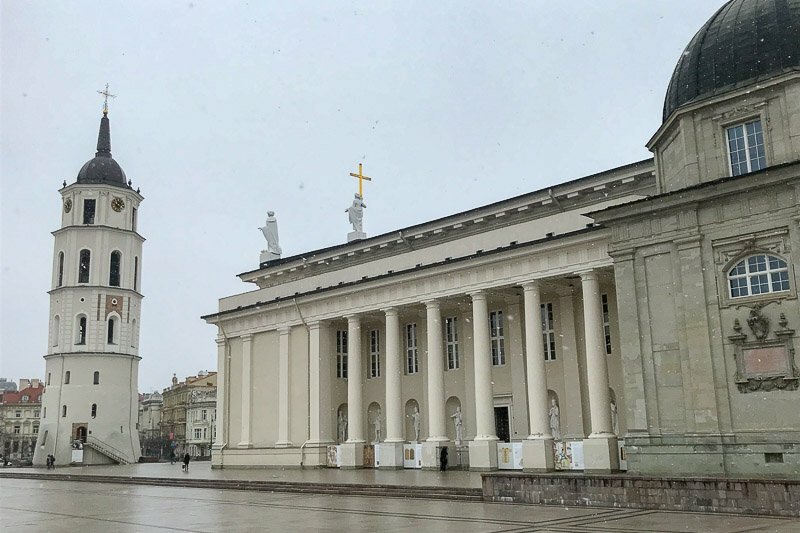 The Vilnius Presidential Palace. 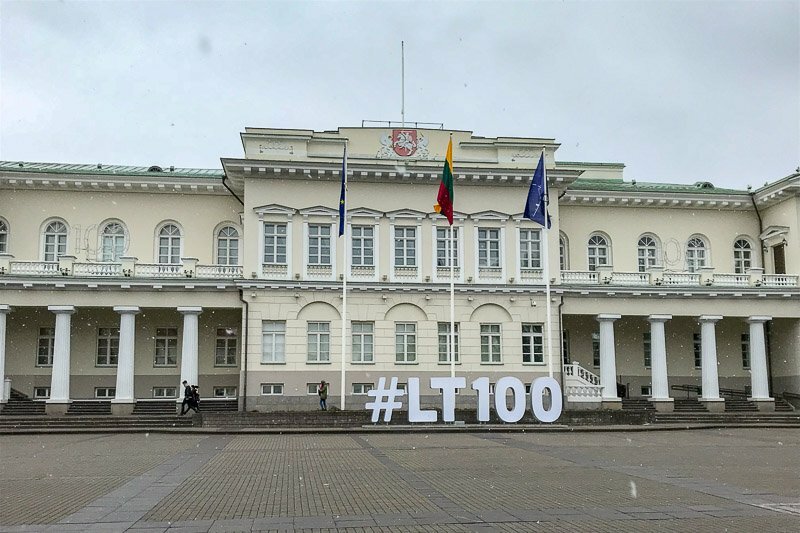 The #LT100 sign is because it’s 100 years since Lithuania first became its own country. Just across the plaza is the oldest university in Vilnius. This may not seem impressive, but this country of three million people currently has 22 universities! One of the old university buildings had to be half knocked down to fit in the Presidential Palace, when the builders realised the plans did not fit on the land they had available. Whoops! We continued our way through the Old Town and through the years. We learnt about the Jewish presence over the years, and the changes the Germans, then the Soviets, forced on the city. Sometimes strange things happened to allow the people some hope. 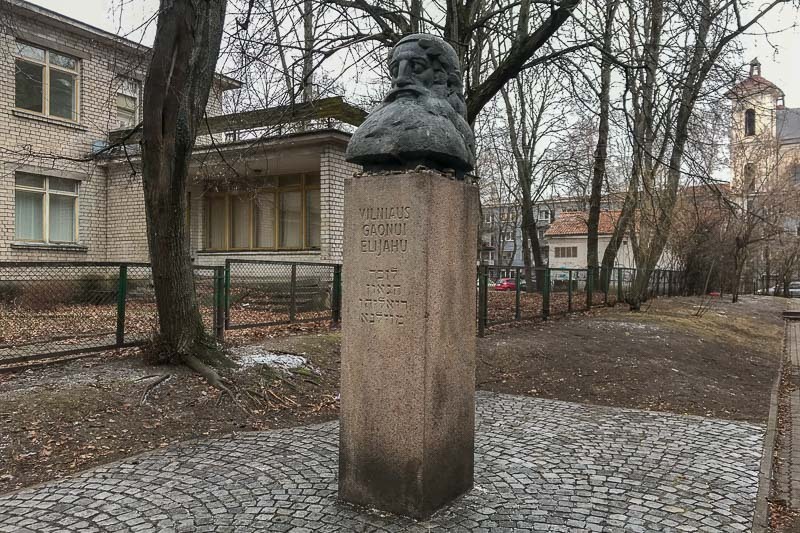 The below statue commemorates one of the local Jewish heroes known as Vilniaus Gaonui, but the only way the people could erect such a memorial was to not have it looking anything like the man it was to commemorate. This is actually the likeness or Karl Marx! 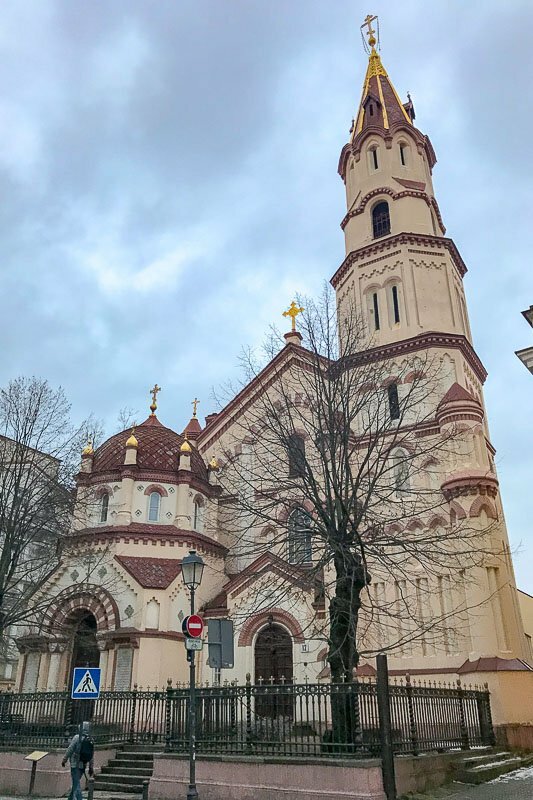 Vilnius is a city of churches and there really is one on almost every corner. 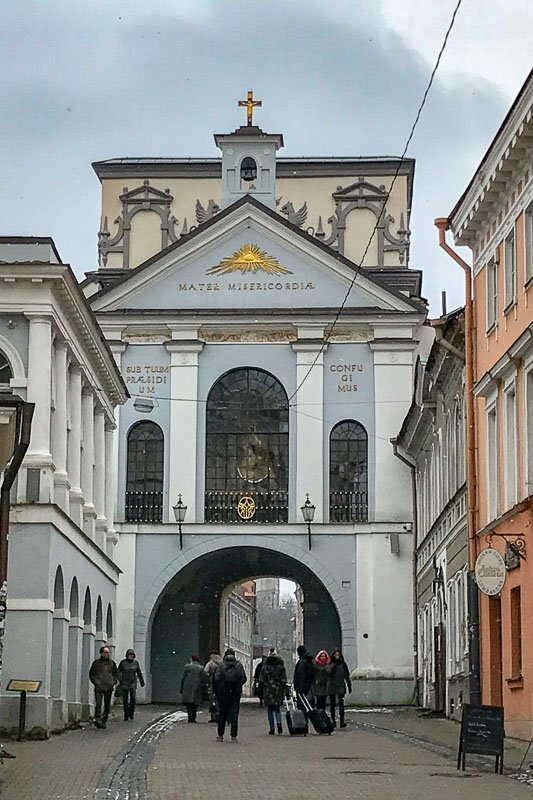 The city seems to have done a great job of retaining so many churches through the Soviet years when religion was outlawed. Most churches now are Catholic or Orthodox – who seem to build some of the most beautiful in my opinion. We walked past and discussed the history of a handful of these churches during the course of the morning. Another church! Yes, they really are everywhere in Vilnius. We walked to a higher area just outside the Old Town that usually has some fantastic panoramic views – or so we were told! The snow was coming down quite heavily at this point and we had almost no view at all. There were some interesting parts of the town wall here, but I didn’t hear much of the story about it because it was here that I discovered something amazing! 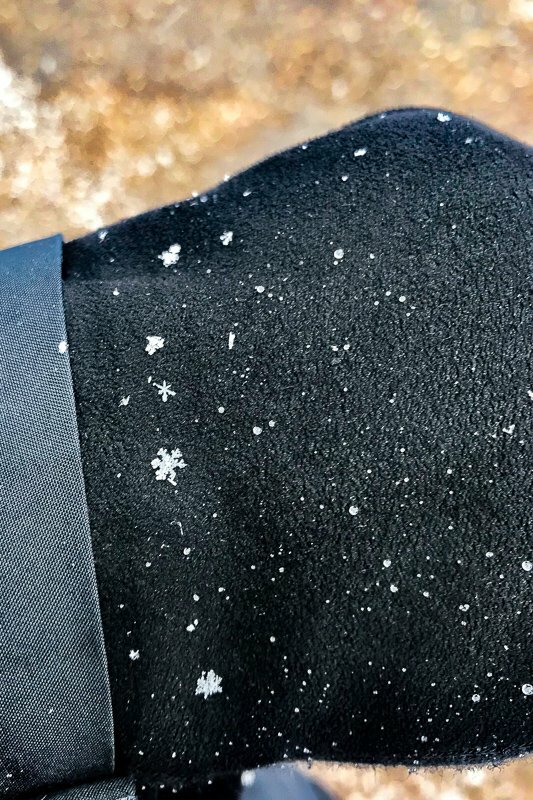 I had no idea that it was actually possible to see the shapes of individual snowflakes! The snow was so soft and perfect and the flakes landing on my black gloves did look just like tiny versions of those paper snowflakes we made in primary school! I was so excited I spent the next little while trying to catch just the right flakes and take a photo. It was hard with only my phone (my camera is still not fixed), but the photo below gives you the idea. 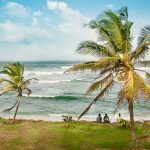 So cool – literally! During our walking tour we went to a location that usually gives great views over the old town. Unfotunately it was snowing too hard for use to see much. 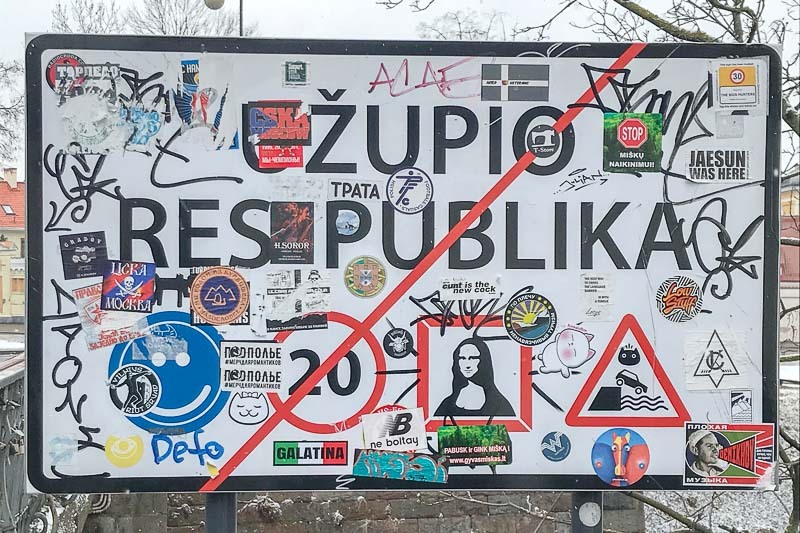 The next part of the walking tour ventured into the Republic of Užupio. Literally meaning on the other side of the river, this place does act as it’s only seperate little area, with it’s own constitution, currency, and although now disbanded due to being unnecessary, military! 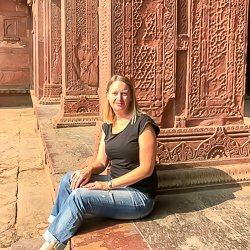 It all seems to be taken very seriously, and the rules of visiting include making sure you smile! The Republic has quite an arty vibe to it, and celebrates it’s independence day on 1st April (April fools??). 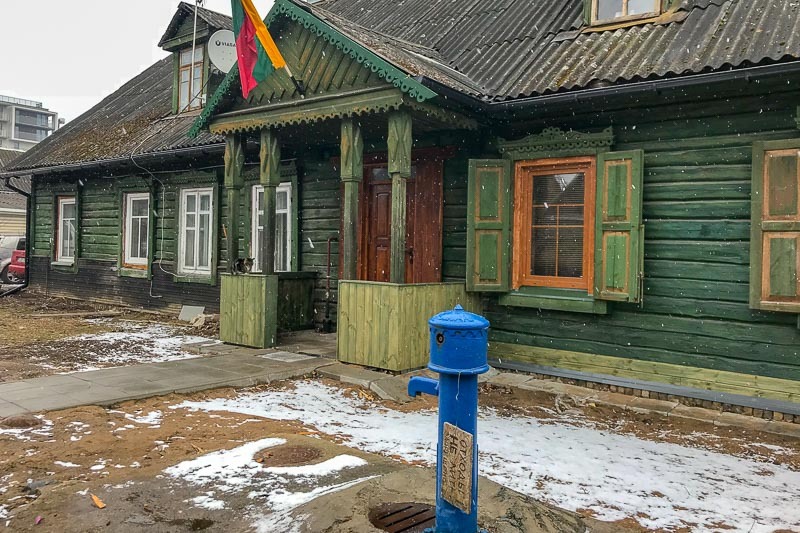 A few years ago during their Independence Day celebrations, they tapped the hydrant in the main square so that it served free beer all day, now each year all the locals as well as those from across the river come to check if it has been done again! Some of the art pieces amongst the snow on the riverbank. 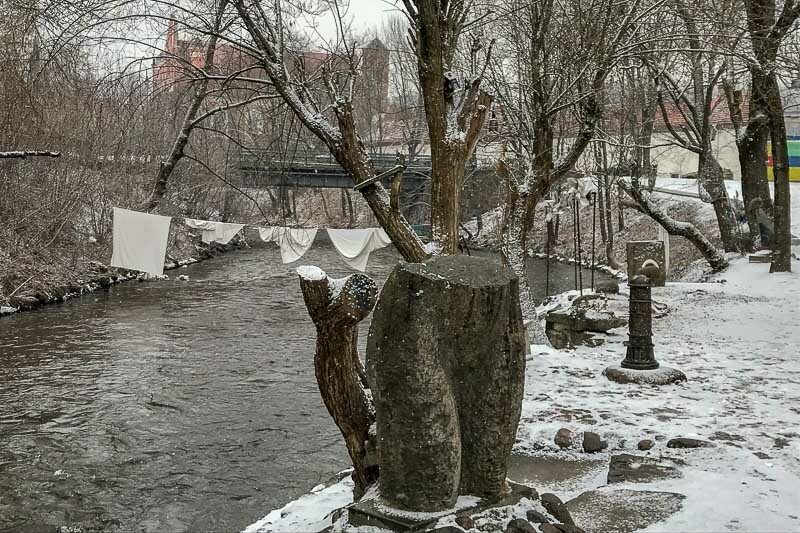 That’s not a washing line, but art. 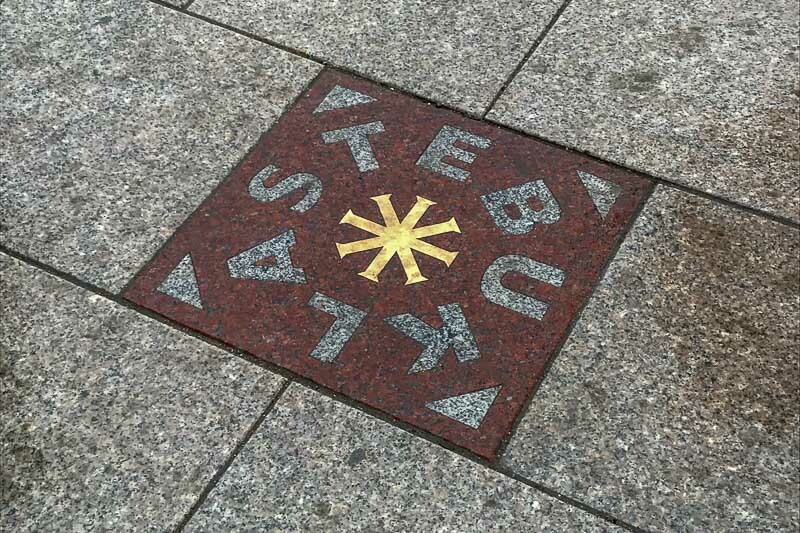 Our final stop was “Literature Street”, an area that commemorates many Lithuanian writers from over the years. 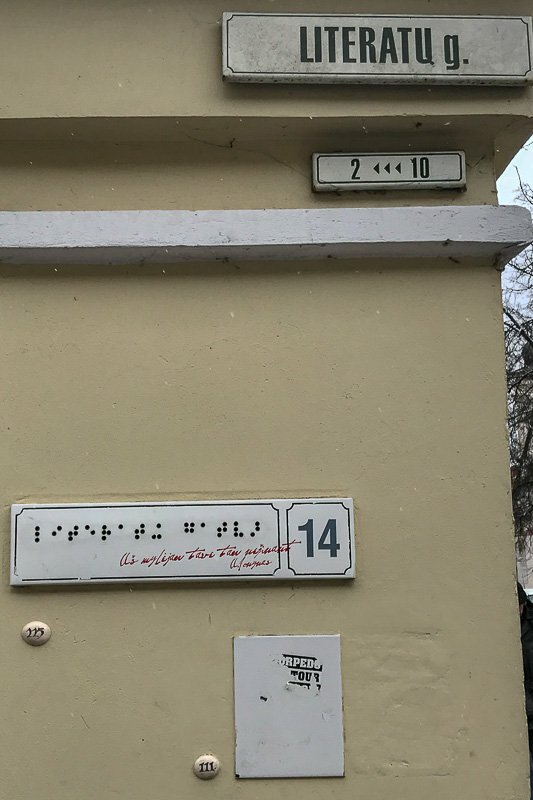 Interestingly, the street name is also written in Braille in recognition of that form of writing too. I noticed on our walk at least two Little Free Libraries on the streets (and saw another one later on) and numerous bookstores, so it seems this city really is serious about promoting literature and reading. We now had fifteen minutes to defrost a little, grab a coffee and a snack before the afternoon tour began. The same guide was running the afternoon tour too. 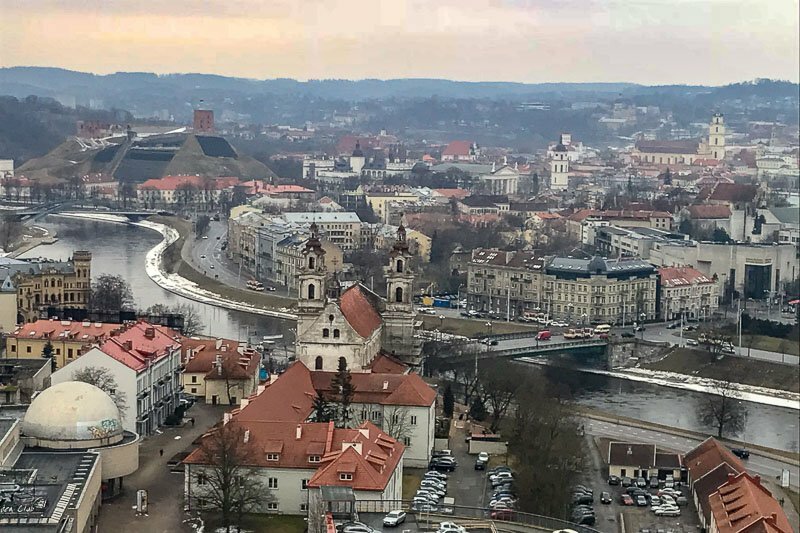 This tour was the Alternative Tour and it shows the other side of Vilnius, one that often tourists don’t get to see. There were three main parts of the tour, with it starting in the same place as the earlier tour, right near the Vilnius Cathedral. 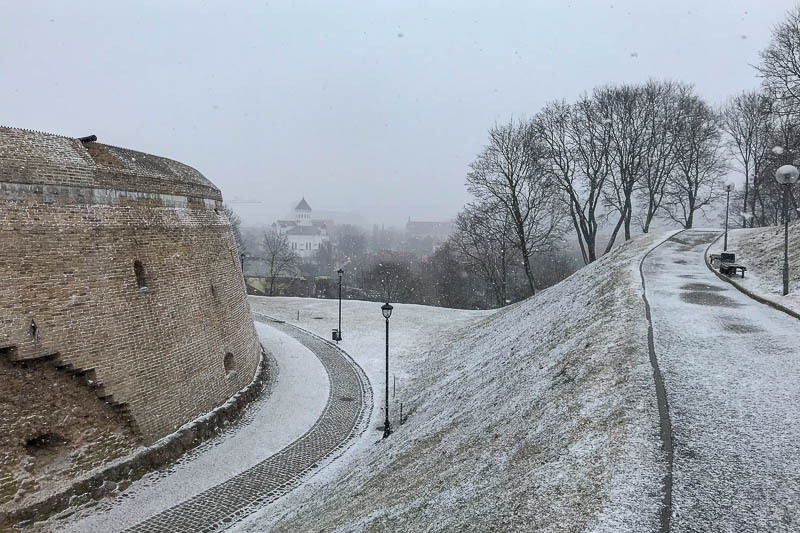 The first part was a brief rundown on some of the history of Vilnius, but I was surprised to find only a little overlap of the basic facts given on the previous tour. 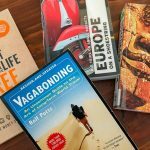 The focus was slightly different and included some other interesting tidbits not included earlier. 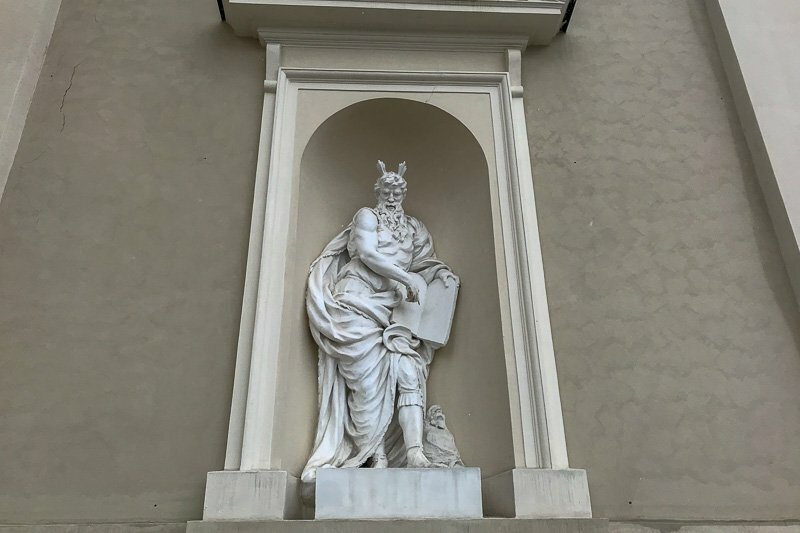 For example, there is a statue of Moses on the front of the Vilnius Cathedral, but he looks a little strange. In this version, he has horns! This was an error that occurred due to a translation into Hebrew, where the author was talking about Moses “radiating”. Unfortunately the word used in Hebrew was “keren”, which also has a second meaning of “growing horns”. The artist of this statue clearly used the second interpretation of the word! This is not the only place where that error was made, even Michelangelo’s Moses has horns. Just a few steps away from Moses there is a commemorative plague paved into the ground. The is the place where the Baltic Road began (or ended). Back in 1989, during the Baltic states’ fight for independence a human chain was created that went through all three countries, from Tallinn to Vilnius, passing through Riga on the way. It was 675km long and a peaceful protest designed to draw the attention of the world to the fight for freedom from the Soviet Union. For the next part of the tour we took a bus to the Šnipiškės neighbourhood. 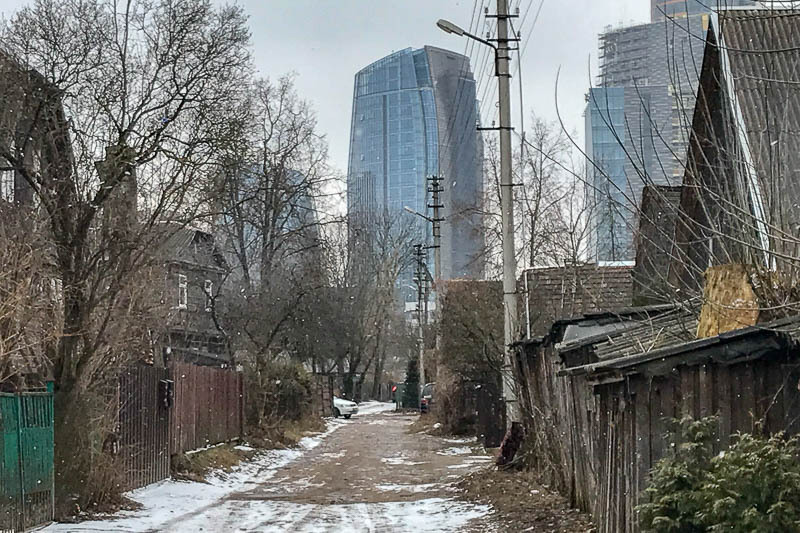 This area is often known as the slums of Vilnius. Much of the area comprises of old timber houses, mostly without running water or inside toilets. It’s a bit of a political issue for Lithuania, as it goes against some of the EU regulations. Most of the population have been here for all their lives and do not want to move or can’t afford to. 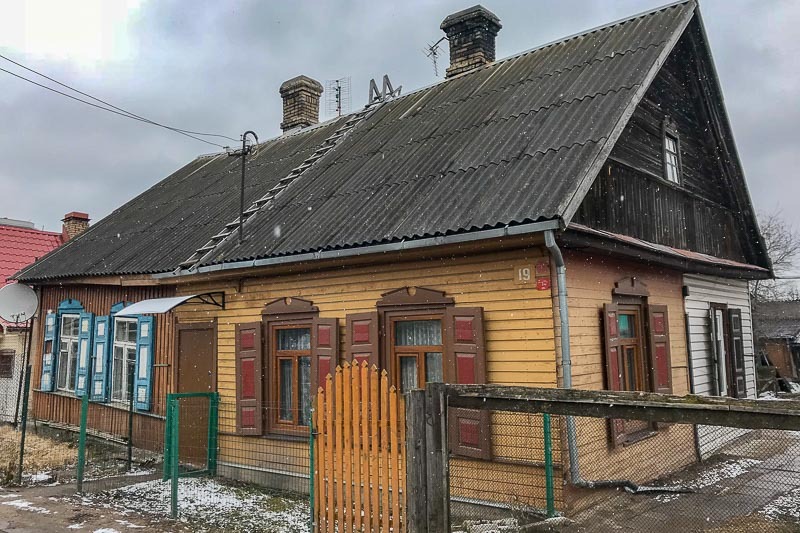 Here is is possible to see remnants of the Soviet policy of “everyone must have a home”. 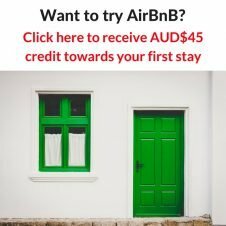 This was a great idea, but what it meant in practice was that often a house that was originally built for one family now housed three or four families – or even more. Each of those families have decorated their part of the building over the years, sometimes leading to multicoloured façades. Here’s a good example of house with at least three different families living in it. From this view we can see three different colour exteriors. Today the area is growing smaller and smaller, with highrise buildings gradually taking over as the valuable inner city land is acquired. It is almost as though this area is an embarrassment to the locals – our guide had heard from one of her former participants that this slum area is worse than anything in Albania (who are not in the EU and therefore perceived as less progressive). I can confirm this is wrong. While this area is old with overgrown gardens, falling down buildings and not a whole lot pretty about it, it does not have piles of garbage in the street or the many stray animals that I saw in one or two small areas in Albania. 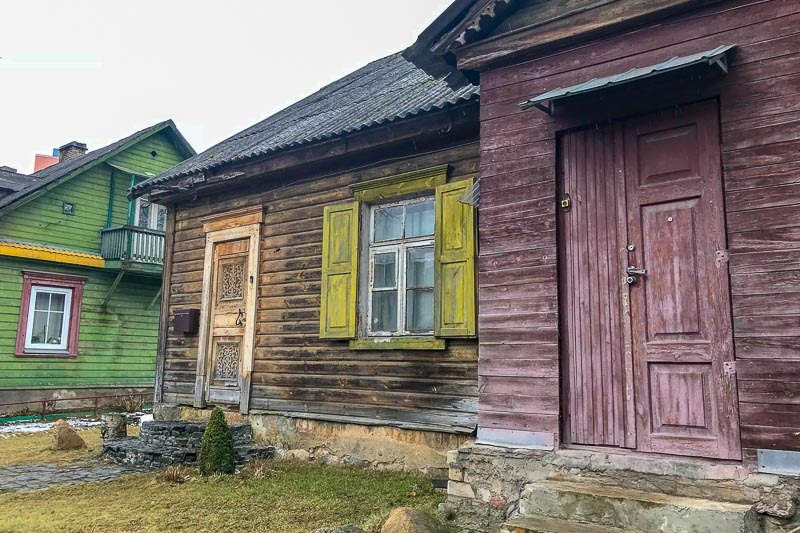 I don’t think there is much hope for preservation here, but it’s a shame as there is a kind of charm about the old wooden buildings. 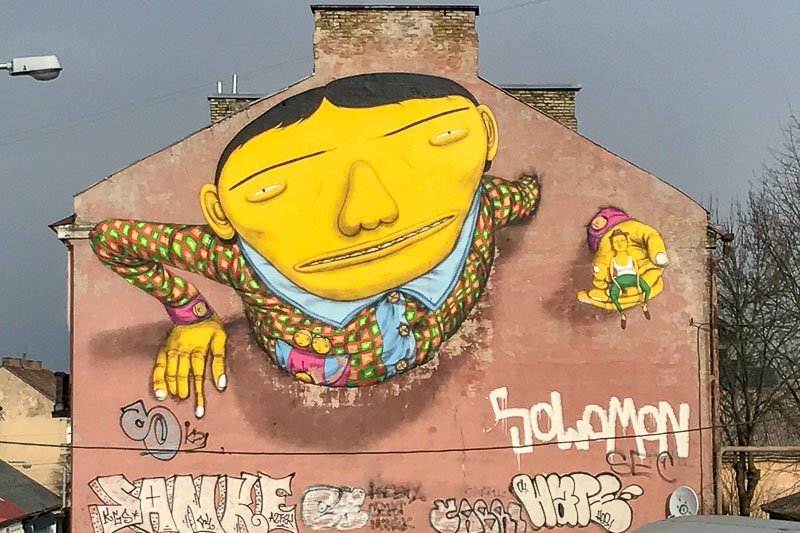 The third part of the tour took us to the Stotis area to look at some of the street art. 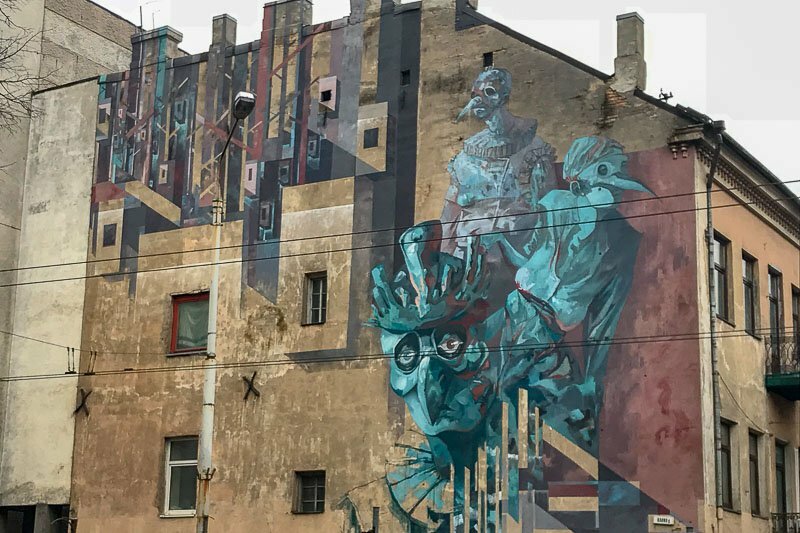 In 2015 a few well known European artists came to Vilnius and added their artwork to the buildings and walls in this area. The most controversial pieces are in and around Keulė Rūkė Barbecue Restaurant. 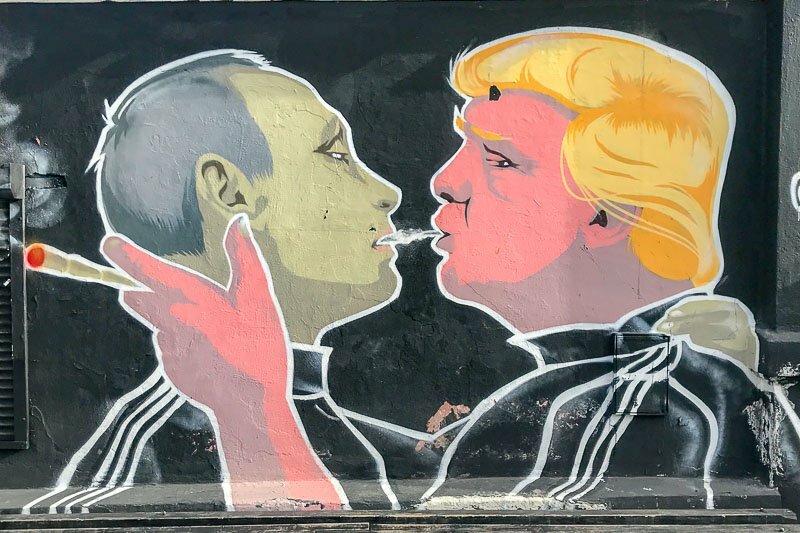 Here is where the Trump/Putin take off of the more well known “Fraternal Kiss” picture on the Berlin Wall is located. It’s essentially a protest about the extremely tough cannabis laws that exist in Lithuania. This is the second incarnation as it has already been painted over once and then redone. 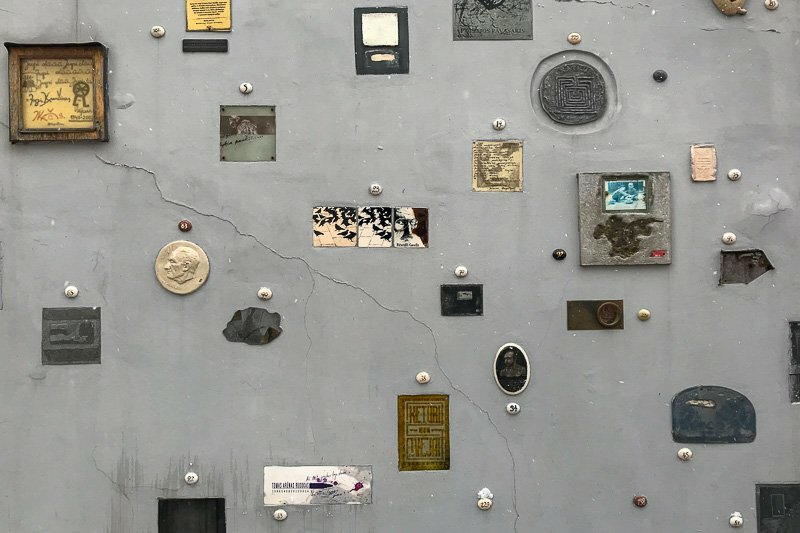 Looking through the gates it is possible to see more digs at Trump, with pieces about Mexicans and walls. It’s not just outside politicians at risk of ridicule though, across the road is another picture depicting three of the LIthuanian politicians. It has recently been defaced (literally), but when it first appeared the three politicians got together and took a selfie with it, so they couldn’t have been too offended. You can’t miss this street art! Our tour ended nearby, and we hadn’t eaten properly since breakfast, so we made our way back to the Old Town to eat at a restaurant called Forto Dvaras. It was recommended by our guide and serves traditional Lithuanian food. By the time we arrived there it was five o’clock, so we hoped that was a reasonable time for dinner. There was no crowd, so that was one good thing about eating so early. Simon had been feeling a little unwell, and is unadventurous with food at the best of times, so it was up to me to try something new. I had a traditional zeppelin with meat and sour cream. 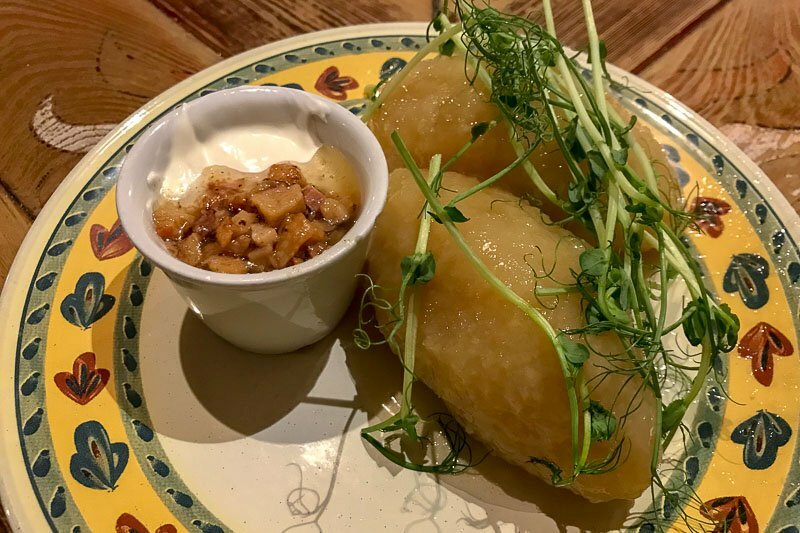 I was expecting something like a backed potato, but here the potato was soft and glutinous around a centre of chopped pork. It was served with sour cream and more chopped meat, possibly bacon or ham. Now I am not the biggest pork fan, in fact if I had known the “meat” listed on the menu was pork I would possibly have ordered something else, but overall it wasn’t too bad. I won’t be rushing out to find it at home, but if it was put in front of me again I would eat it without complaint. Tired and full, we rushed back to the bus station – about a twenty minute walk – to jump on a bus back to our hotel. We arrived at our deserted highway bus stop just before the last light left the sky. If we were later, it would have been an awfully dark area to walk along the road, even if only a couple of hundred metres, as there was not a light to be seen. We woke again to a second day of snow. There were still things I wanted to see and do so we were going to head out, but with the memory of a whole day out in the snow still fresh, we dragged our heels a little. It was late morning before we went into town, this time using the hotel shuttle bus, since it was leaving the same time we were. We were dropped off at the Gates of Dawn, one of the places I had on my list to have a look at. The gate was originally part of the defensive walls of the city, and the only one remaining. 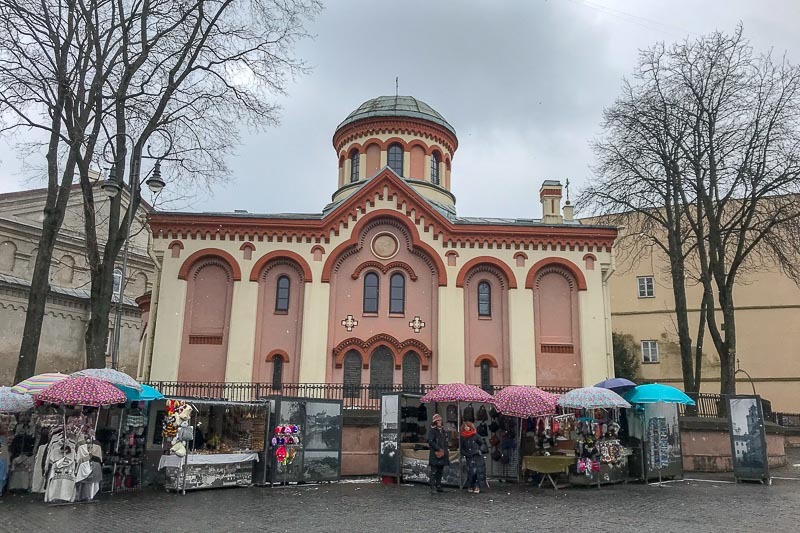 The chapel that is part of the gate contains an icon from the Virgin Mary, so this is a particularly revered by both the Roman Catholics and those of Orthodox faith. Unfortunately we didn’t get to have a good look at it as there was a beggar approaching everyone and harassing us all for money. While not aggressive, he was definitely persistent, and really the only way to stop him was to walk away. I only remember seeing two or three people in Vilnius begging, so it’s not widespread, it was just bad timing. We planned to return, but I completely forgot about it. We continued to explore the old town, walking from one end to the other through different streets than we had the day previously. Eventually we started to make our way to the final destination for the day. But on the way we made just a small detour to see something that causes many quizzical looks in Vilnius. I am of course referring to the Frank Zappa statue. Frank wasn’t born in Vilnius, he never even visited, so why the heck is there a statue here dedicated to him? 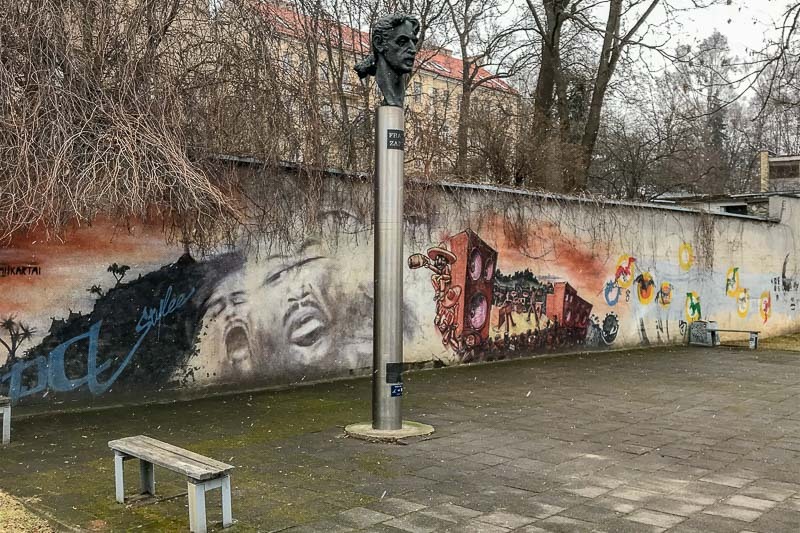 The statue was erected in 1996 and they were looking for people who pushed the boundaries, and since Frank Zappa had become a popular figure whose music represented freedom and nonconformity, he fit the bill. Hence the statue! I was expecting the statue to be in a park, but it was in a small paved area adjoining a car park. The street art along the wall was pretty good though. 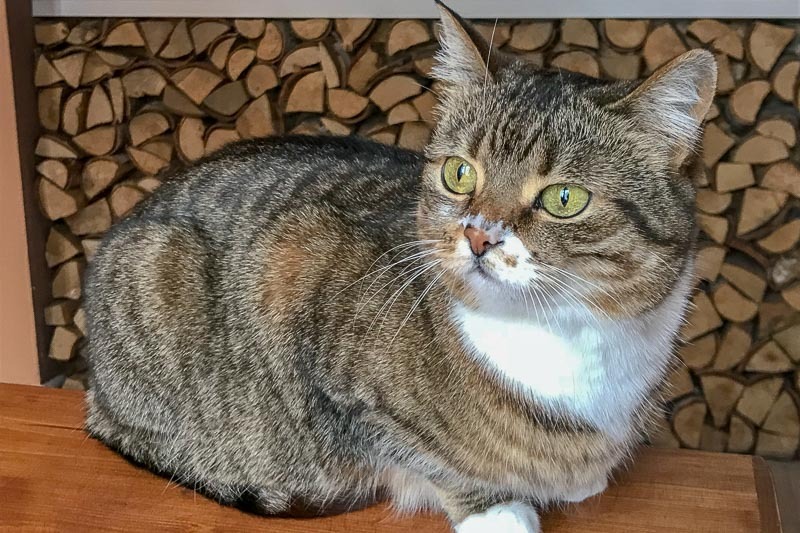 Another fifteen or twenty minutes of walking brought us to our destination for the day, Vilnius’ Cat Cafe! After our fantastic cat cafe experience in Chiang Rai, as soon as I saw signs in town about this one I wanted to visit. And I was not disappointed. We had a late lunch and coffee while we were there, and happily interacted with the cats for at least an hour. 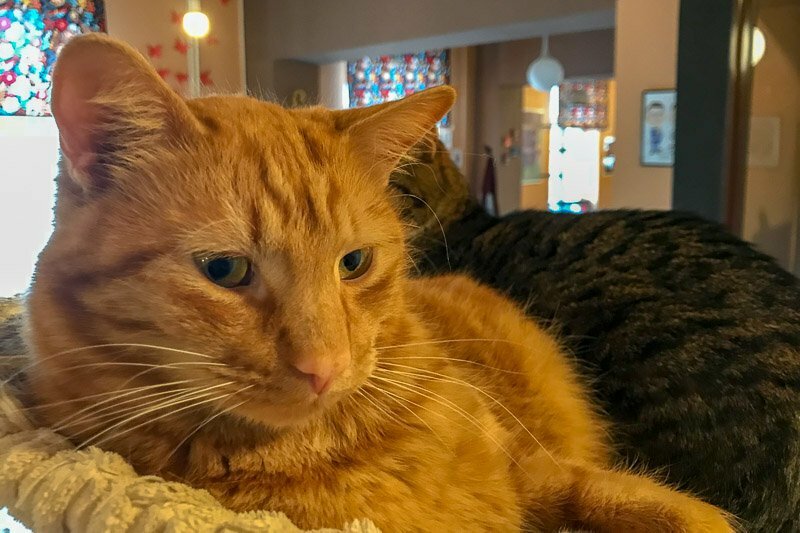 I loved that the staff have genuinely bonded with the cats, and the cats – all rescues – look healthy and happy. They were not scared to approach customers, and really were lovely to be around. 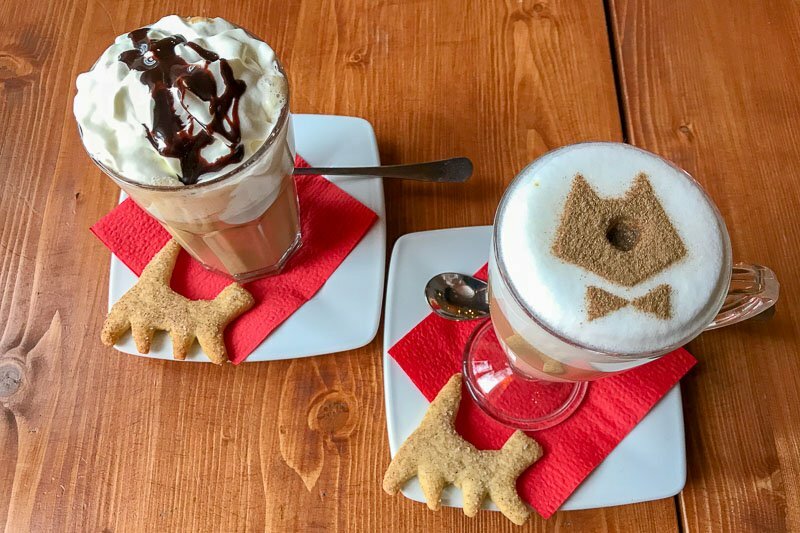 How cute are these coffees with the cat biscuits! As we made our way back out into the cold and snow to walk back to the Old Town we discussed our options for the rest of the day. Simon had been feeling unwell, and I was wilting in the cold, so we decided to call it a day and escape back to the warmth. 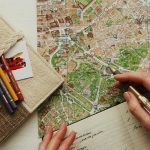 We stopped in a supermarket to pick up a few supplies for a light dinner (since we had a late lunch anyway) and jumped on the bus to again travel the ten minutes out of town – that felt like we were right out in the countryside! It still surprised me how close to the city centre the city limits were on that side of town! 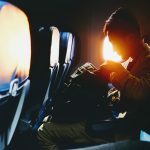 We were up early the next morning as we were spending nine hours on a bus to our next destination – and what did we see again since it was a travel day? Yes, beautiful blue skies with not a hint of snow in sight!